Here is just another reason why Benny Gold is one of the nicest and influential people in the industry. Here is a guy who is not only an accomplished and sought after designer but also the owner of the very successful Benny Gold brand. And how does he spend his free time? 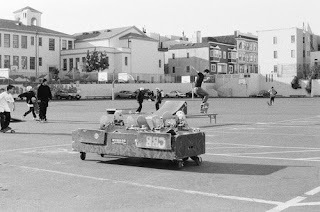 Working with an after school skateboard program in SF. Sure he probably skates every afternoon anyway but the fact that he is willing to share his time, skate advice and give kids a legit role model when he could be doing his own thing or skating with pro skaters...c'mon now. Could you imagine if The Hundreds, HUF, Supra or Supreme embarked on such a venture. Sure these guys are busy but think of the positive impact they could have with a monthly skate session. Or even sign up some gear and auction it off for charity. I mean who wouldn't want to buy a graphic sketch done by the masterful fingers of Bobby Kim or a HUF sample signed by Keith. If anyone in the industry stumbles across this, consider that an industry challenge.